Beep. Beep. I'm back with another tour! 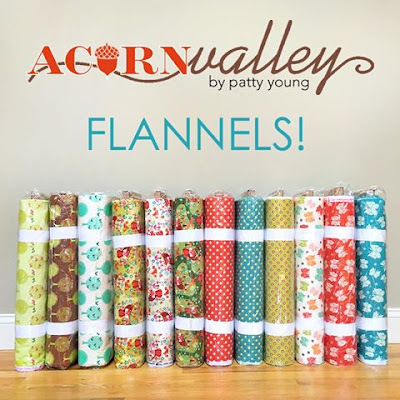 This time, I am so excited to be on tour with Patty Young of Modkid showcasing three of her patterns in her newest fabric line -- Acorn Valley for Riley Blake. This line comes in both flannel and knit. For this line, there are 5 prints available, each in 2-3 colorways. I decided to keep it cool and comfy since it's nearly 100-degrees every day right now. I chose several knits from the new line and made two looks -- one for each daughter. First up, is my 5 year old in a new Melanie Dress. She has sadly outgrown her original one and she's been hinting for another. For this dress, I chose to pair the Leafy Chevron (in teal) with Forest (in cream). 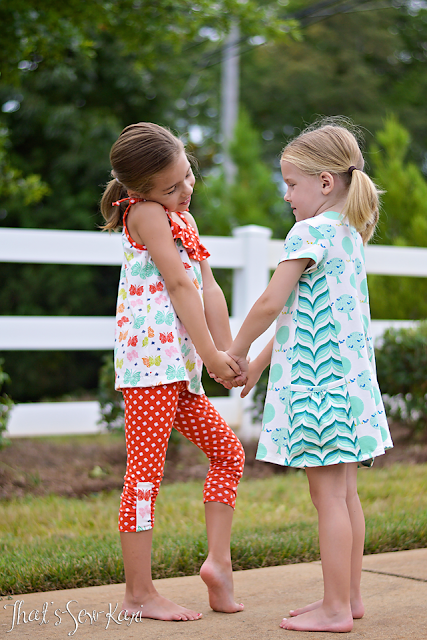 I had originally picked out Bloom Dot (in teal) to use for the pockets, but I decided I liked the leafy chevron all the way down the side. 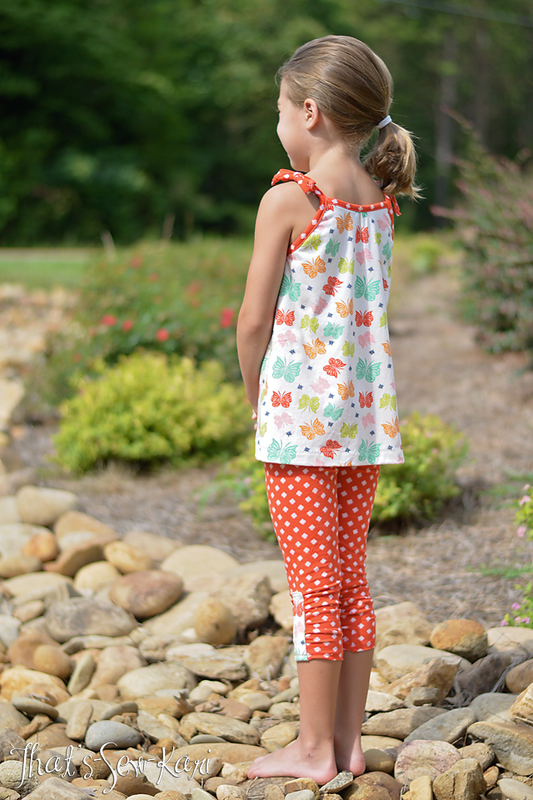 I'll be making the Bloom Dot into some coordinating Perfect Leggings (shorts length) for her to add underneath for Kindergarten. 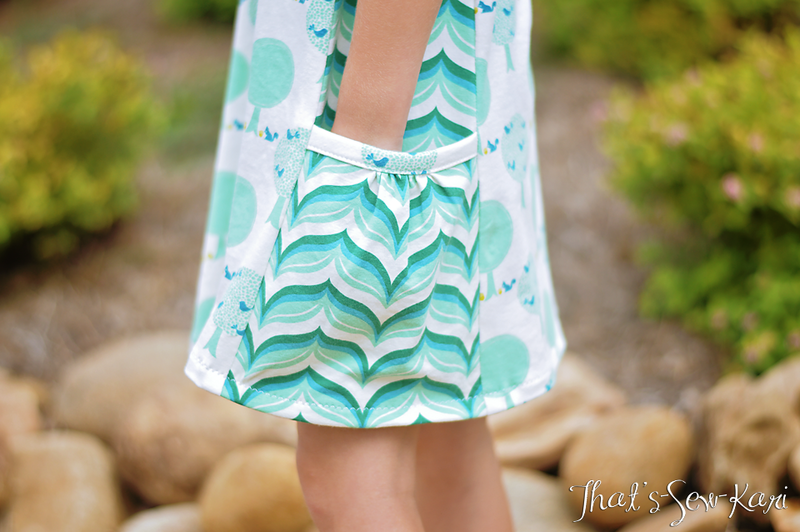 I just love these two fabrics paired together!! She's a happy girl! She's taken a bit of a break modeling for me so I'm happy to see her back at it. Her first Modkid Dress was the Melanie and she's grown so much since that first one!! 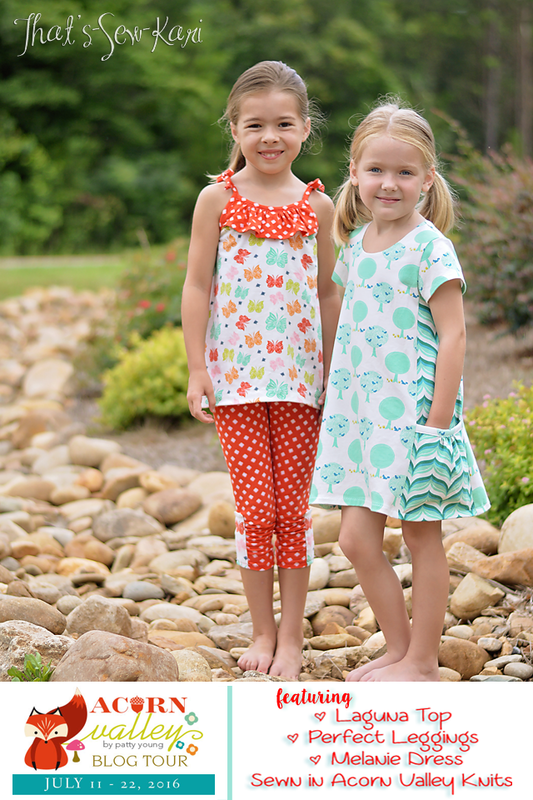 Next up, we have Modkid's newest patterns -- the Laguna Summer Top Collection (View B) and the Perfect Leggings in Capri length. 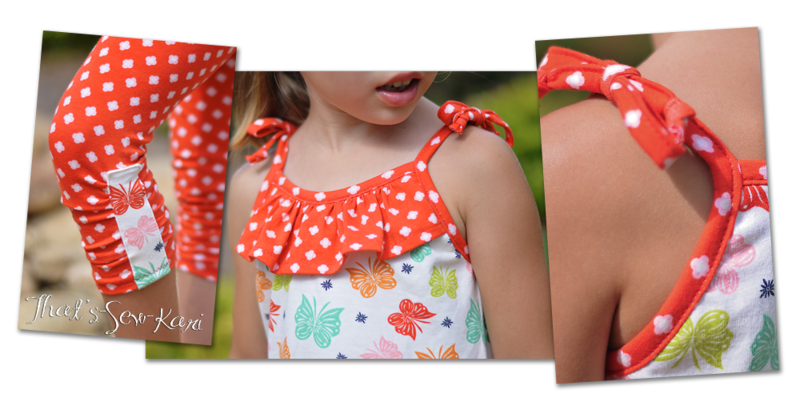 The fabrics I chose were Flutter (in multi) and Bloom Dot (in red). My 7-year old loves butterflies and looks great in red! 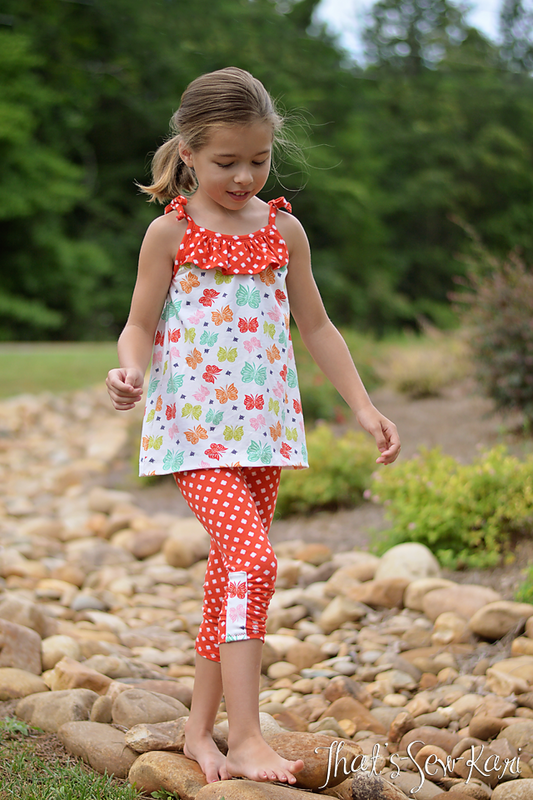 I chose to add the decorative tabs on the leggings -- I fussy cut the butterflies from the shirt fabric. I was a bit apprehensive about the tackling the binding on the Laguna, but I have to say, it went together so easily! After the first tie, I had to take a moment to marvel in the beauty. I do want to mention my secret weapon for binding -- a glue stick! It helps the binding stay in place, dries quickly, and doesn't gum up your needle. After I get my binding glued in place, I give it a quick press with the iron to really dry it. She has worn this outfit a few times since I've finished it and is begging for more! 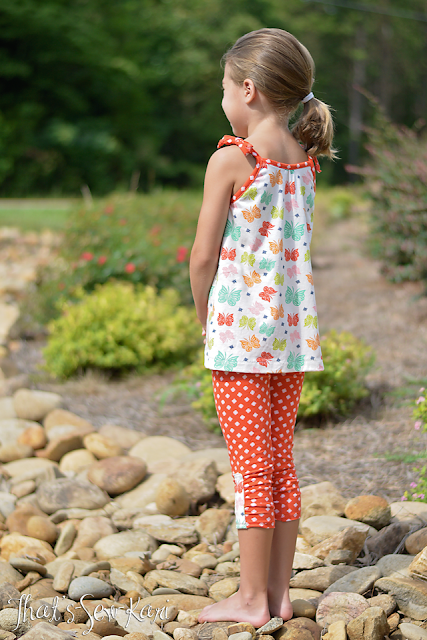 The knits are so comfy and easy to sew too. They are 95% cotton/5% lycra which is great for binding as well! SALE ALERT: Coupon code AcornValley2016 gets 25% off your entire purchase in the Modkid Etsy Store. Valid July 11th through July 22nd at midnight EST. Check out the rest of the Acorn Valley Blog Tour line up! Also, try your luck at winning a package of her coordinating flannels!